I am so heartened by how creating mandala's gets into ones bones and once you start it's hard to stop. 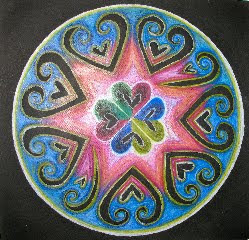 Scarlet, who was in our New Year's Intention Mandala Workshop just sent Patricia some new mandala's that she created since the class ended... She fell in love with the process and has just been drawing and drawing. The process of setting a healing intention while drawing is a form of active, dynamic meditation. Art as Medicine, Art Making as Prayer. 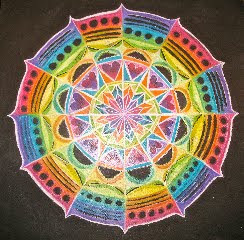 Not only is the process healing but the energy and intention of the mandala is set into motion. 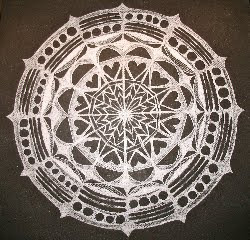 Here is another one of her Illuminated Mandala's with white pencil on the black ground of the paper. I feel honored by witnessing how this process has lit a Creative fire for Scarlet. What a blessing for her and a gift for me and Patricia to witness in retrospect.